Want to build your own Arduino DIY projects? Check out this complete Arduino starter kit & course bundle - it includes a full kit of all the hardware you’ll need, plus 25 hours of expert, step-by-step training to get you started. Right now, Jalopnik readers can get this bundle for 85% off. Arduino is the ultimate do-it-yourself electronics platform, and has garnered a community of enthusiasts who’ve made some pretty incredible projects. Arduino’s micro controllers allow you to integrate any digital and physical signals, so you can create anything from simple sensors to RC cars - there’s no limit on the possibilities of what you can hack together. 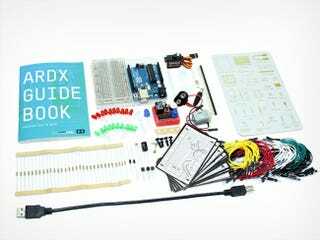 With this complete starter kit, you’ll get everything you need to build your own projects and learn all the fundamentals of Arduino programming with step-by-step instruction. The total value of this bundle is $520, but Jalopnik readers can pick it up for 85% off - just $75.99 (includes shipping). For more information, hit the link below.